Che Troi Nuoc, literally translated as dessert floating in water. Everybody in my family loves this dessert. My mom and dad are expert mochi baller. When I was little, they use to make it together but now my sister-in-law and I have taken over that duty. Our balling technique is no where close to my parents. While theirs are perfectly round and uniform, ours are lumpy at times and all different sizes. Hopefully practice will make perfect! 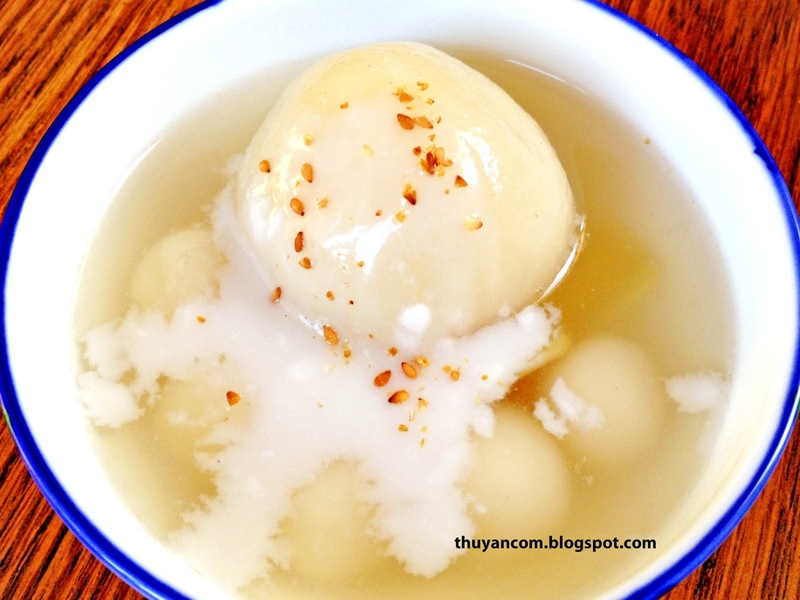 This dessert is made by balling glutinous rice dough with a mung beans filling. 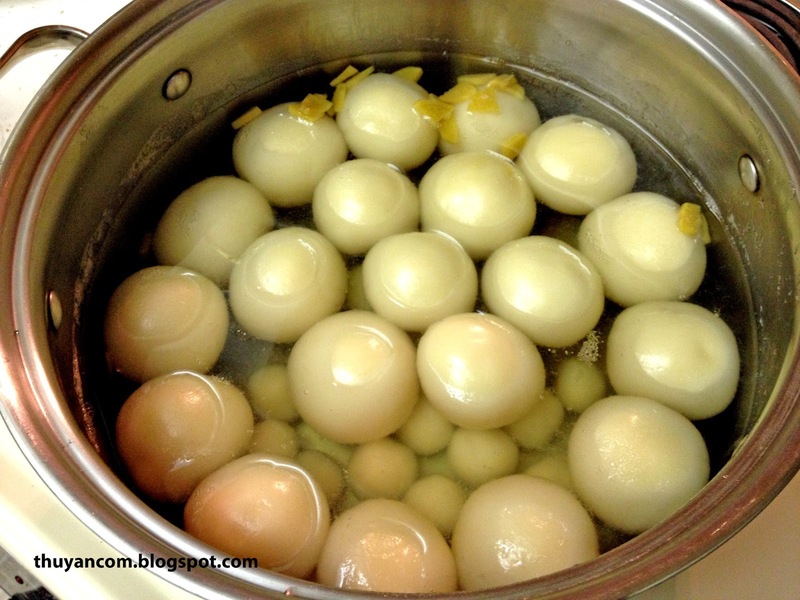 The glutinous rice ball is then serve in a bath of ginger syrup. If you have ever eaten this dessert you will know there are two type of rice balls. The bigger ones are usually filled with mung beans and the smaller ones is just plain glutinous rice dough. My favorite is definitely the smaller balls because it soaks up the ginger syrup better than the bigger one. What I love about this Che is the savory aspect of it. While the ginger syrup is sweet the filling is actually salty. The mung beans is seasoned with salt, ground pepper, and pig's fat. So when you cut into a filled rice ball you will taste both sweet and salt. While I have made this Che a few times by myself, I'm much more comfortable making it with my family. There are a lot of steps that is difficult to explain especially the making of the dough and the balling technique. For that reason I have found a YouTube video that explain those technique very well and it would be a good reference than my instruction. 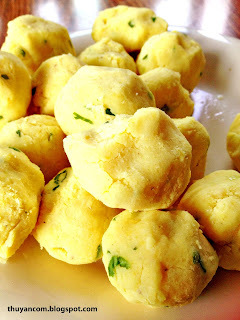 I will provide the recipe for making the mung bean filling, the ginger syrup, and coconut sauce. Good luck and happy cooking! 1. If possible soak the mung beans in water for 2-3 hours. This will help the bean soften and it will be easier to cook. You'll want to wash the beans a couple time before soaking to get rid of the yellow coloring. 2. Cooking the mung beans is very similar to cooking rice on the stove top. In a pot, you'll want to add enough water to cover the beans and about 1 teaspoon of salt and then cook it on very low heat. Let the beans soften more and expand. If most of the water has evaporated before the mung bean has soften and expand just add little bit more hot water to the pot and let it continue to cook. 3. Once the beans has soften enough, take a soup spoon and mash the beans into a smooth dough. At this point you will want add the green onions, about 2 teaspoon of vegetable oil, and the ground pepper (about 1 teaspoon) to the mung beans. Continue to mash and mix everything together into a smooth dough. Add more salt if needed. 4. Let the mung bean mixture cool and then you can knead it into small ball. You can refer to the video. Not all ginger syrup is the same, it really depends on personal preference. Some people prefer it to be more subtle like a liquid then a thicker syrup. If you it want it to be a like syrup you'll want to use less water and more sugar. If you want more of a subtle and light taste you'll want to use more water. I prefer more of a syrup. 1. Dissolved 2 cups of sugar with 6 cups of water in a pot on low heat. Add about 1-2 knob of ginger sliced. 1. Heat up a can of coconut milk on the stove. Taste it with a pinch of salt. Sprinkle some tapioca flour into the coconut milk to help thicken it and stir well.